Lance Robertson is a long-time journalist and public relations professional. An instructor in the School of Journalism and Communications since 2003, he has taught courses in both the public relations and journalism sequences. Lance spent the first 25 years of his communications career as a reporter and editor for a handful of Oregon newspapers. He specialized in environmental coverage during a 17-year career at The Register-Guard, where he won numerous state and regional awards for his coverage of some of the most pressing natural resources issues of the last half-century. He also covered the wood-products industry from a business perspective. In 2001, Lance left newspaper work to serve as the communications coordinator for the Eugene Water & Electric Board, Oregon’s largest citizen-owned public utility. He later served as Public Affairs Manager for EWEB, where he directed a nine-person staff responsible for the utility’s external and internal communications, including media relations, strategic communications, public involvement, the web site, graphic design, marketing and government affairs. 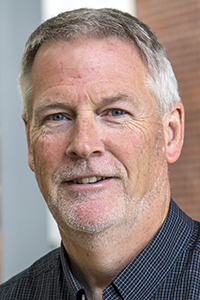 Lance retired from full-time work in 2016 and does strategic communications consulting, freelance writing and editing, in addition to his part-time teaching duties at the UO. Lance has served on the national affiliate board of the International Association for Public Participation (IAP2), which is dedicated to good public engagement in decision-making. He also has been a fellow of the University of Maryland’s Knight Center for Specialized Journalism, and is a senior fellow of the American Leadership Forum. He lives in Eugene with his freelance-writer spouse, Sarah Robertson. They have two grown children – both of them Ducks.